Sun 22 March San Francisco Grace Cathedral 4:00 PM American Guild of Organists program of Holtkamp Award winning contemporary compositions. Several organists performing. I played "Prelude and Fugue in F Minor" by Rachel Laurin. Sun 23 November San Francisco Fourth Church of Christ, Scientist 1:00 PM Lecture/discussion on how to listen to Messiaen's musical language, Messiaen's music as a means to spiritual enlightenment, transcendence. Sun 17 Apr San Francisco Fourth Church of Christ, Scientist, (corner of Clement & Funston) 4:00 PM free admission with Daniel Pociernicki, tenor I'll be playing both organ and Celtic harp, accompanying Daniel as well as playing a few solo pieces. 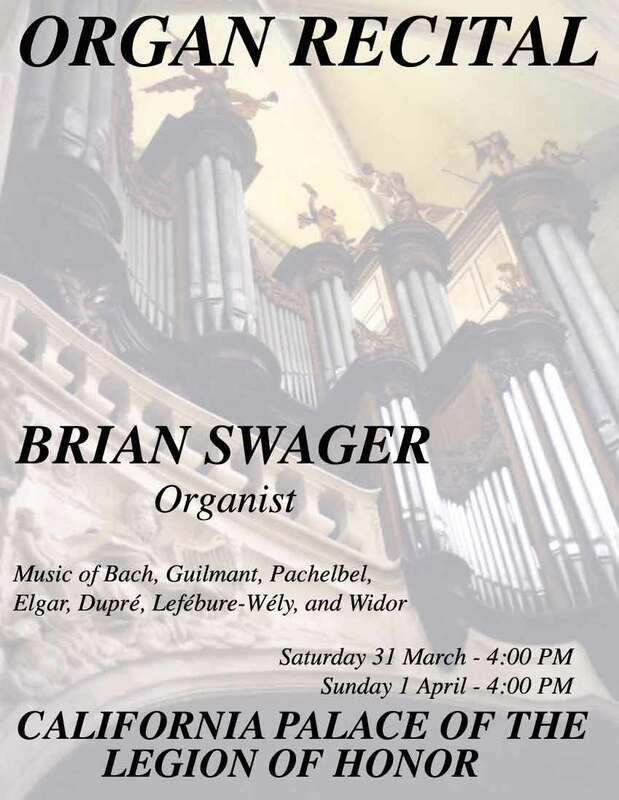 The program includes songs of the Hebrides, vocal music of Purcell, Handel, and Schubert, organ music of Louis Vierne, and harp music of Marcel Grandjany.